Bangkok (Thailand) – January 5, 2017 (by Bernard A. Metzger) – For those who seek a transcendent experience, a selection of river cruises replete with the colonial romance of river travel but with a modern twist and bespoke itinerariesis set to be launched. Mekong Kingdoms cruises recreates and elevates the concept of river travel with their fleet of five vessels where guests can enjoy first-class services from gourmet meals to plush cabins with unique, curated experiences both aboard and ashore along the way. Cruising along the mighty Mekong River from Thailand’s Golden Triangle to the ancient Lao capital and now UNESCO World Heritage city of Luang Prabang, conjures up images of old Indochina, of languorous days gone by, teeming with river adventure, mystical temples and stunning untouched scenery. Mekong Kingdoms boats offers a new way of river travel with a sense of playfulness and discovery that leaves guests with a truly unique and unforgettable travel experience. 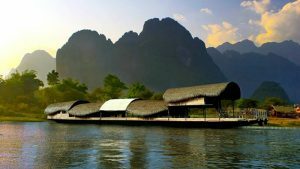 Travellers can join Mekong Kingdoms’ flagship ‘Bohème’, a 42-metre, 13 cabin luxury barge at Luang Prabang or Chiang Khong located near Anantara Golden Triangle Elephant Camp and Resort. Decorated with intricate Indochinese-inspired artwork and fitted with sumptuously comfortable furnishings from bow to stern, ‘Bohème’ spoils with phenomenal facilities including an expansive sun deck, wine cellar, and spa. The journey from Chiang Rai/Chiang Khong to Luang Prabang is two nights as it heads downstream. The upstream cruise takes three nights. Voyagers will be captivated by the languid river lifestyle, soaking in nature’s wonders along the Mekong River Valley, marvelling at encounters with fascinating local cultures. Itineraries include guided jungle treks, a visit to the Pak Ou caves – with its awesome limestone karst formations, these two caves have been gifted thousands of Buddha images, left by pilgrims over the centuries. Guests can make a friend in the Hmong Village at Pak Beng or be taught traditional weaving at Ban Baw and further discover rural Laos by mountain biking in the stunning village of Ban Houy Phalam. Even while cruising along the placid waters, guests have a range of diversions onboard. Sunrise yoga, Buddhist meditation, sunset cocktails, cooking demonstrations, jewellery making classes, fishing for giant catfish – there is a wide range of activities to while away the time. Then there’s always gazing at the lush scenery as the boat glides by. For those desiring a more intimate private cruise, personalised to their tastes, there is ‘Gypsy’ an ultra-exclusive two-cabin cruiser perfect for one or more nights along the Mekong for up to four passengers, Mekong Kingdoms can customise almost every aspect of the itinerary and journey to suit guest’s travel needs. For shorter day trips in complete privacy, ‘Nomad’ provides couples with an exclusive romantic getaway for sunset cruises in Luang Prabang. ‘Play’ is a floating lounge ideal of private events or family adventure; suitable for up to 15 passengers with sundeck, private room, and a sound system. ‘Monsoon’ is a scheduled touring shuttle to the Pak Ou caves with canapés, coffee, tea and soft drinks, offering a lavish option to visit the sacred site. Mekong Kingdoms cruises joins Minor Hotels’ existing fleet of Manohra Dining Cruises in Bangkok and Anantara Overnight Cruises that sail from Bangkok to Thailand’s ancient capital of Ayutthaya.